Susan Edsall’s first book tells the story of believe that he’ll never fly again after he has a stroke. The love Wayne Edsall had for the big sky of Montana was enough even to make his wife, Marcia, of 53 years, jealous. But four years ago, the joy of flight was unexpectedly taken from him. Wayne Edsall was born in Missoula, Mont., in 1929. By age 11, he was hanging out next to the airport outside of town, watching planes take off and land. For his eleventh birthday, his dad bought him a flight in an open-cockpit airplane, which was used to haul cargo to outposts in Montana. He continued his obsession with aircraft by building small model planes throughout his youth. In high school, he would try to take lessons and bum rides into the sky whenever he could. After getting out of the Navy, he got his pilot’s license. Over a 30-year period, he and his best friend, Bud Hall, bought and rebuilt 10 antique airplanes including a Curtiss, a Howard, a Waco, two Tiger Moths, a Stinson, a Stearman, a BT-13, a Birddog, a Fleet Series 9, and a current project, a 1943 Cessna Airmaster. However, every pilot knows what conditions require a license to be relinquished: heart attack, bypass surgery or stroke. The latter of the three grounded Edsall on March 25, 2000. Edsall’s world went into a stall when a sudden stroke left him unable to read, write, speak or perform normal functions. Worst of all, he was told by doctors that he would never fly again. But his family refused to accept the bleak diagnosis, and they decided to take matters into their own hands. His daughters, Susan and Sharon Edsall, came up with a rigorous rehabilitation program for their father. Although Edsall’s left temporal parietal lobe, the part of the brain responsible for speech and communication, wasn’t receiving signals, the rest of his brain was still a beehive of activity. He articulated the frustration of not being able to fly by likening it to a plane that is on the runway and ready for takeoff but has no way of communicating to the control tower. “I could hear and think, but couldn’t talk; it was dark and lonely in there,” said Edsall, as he recalled the months following his stroke. Using her bachelor’s degree in English literature from Montana State University and rudimentary English tactics, Susan Edsall and her sister “rebuilt” the left temporal parietal lobe of their father’s brain. “It was like I was flying in the dark; we were approaching this from the back end first,” Susan Edsall said of the arduous experience. The rigor paid off. On Sept. 25, 2000, approximately six months after his stroke, Wayne Edsall reapplied for his pilot’s license. After another six months of anxiously waiting for an answer, he was finally granted authorization by the FAA for a special issue of a third class airman medical certificate, allowing him to fly once again. Because of the family’s dedication to regaining his status as a pilot, he was back behind the controls of his 1932 Fleet biplane surfing the Montana blue once again. Since that day, you can find the pilot either in his hangar, working on a rebuilding project, or out flying his Fleet or his Cessna 182. He’s retired but still very active in the Montana Antique Airplane Association and the Quiet Birdmen. The experience prompted Susan Edsall to write her first book, “Into the Blue: A Father’s Flight and A Daughter’s Return.” The National Stroke Association recently brought Susan and Wayne Edsall to Denver for a book signing at Tattered Cover Book Store. “It was part of a continued grass-roots effort to educate the general public about strokes, and also about prevention and rehabilitation and recovery,” said Brian Kolonick, NSA. In this uplifting story, the author showcases the courageous and supportive nature of the Edsall family, and also demonstrates her wonderful ability as a writer to be brutally honest, passionately hopeful and downright hilarious. Even though she only began to fly after her father had a stroke, she went into debt to buy a Cessna 172—tail number 14PV—in honor of her father. Now every time she takes off and lands she says, “One Four Papa Victor!” Just as a reminder to herself that anything is possible when you put your mind to it. The family believes that Wayne Edsall’s stroke and the road taken to get him back into the air was just a part of life—a bit of turbulence in an otherwise steady flight. For them, it wasn’t a matter of simply falling down; it was how they got back up. In today’s society, elders are often put into nursing homes or assisted living care when things go awry or they become incapable of caring for themselves. “Putting my father into a nursing home was never an option,” Susan Edsall says. The Edsalls turned the notion that “the doctor knows best” on its head, literally, and successfully achieved the unthinkable. “To have let him simply fade away was never an option,” the author said. “It’s far more amazing to me that people would just give up if something like this were to happen to them,” his daughter said. Susan Edsall said she always wanted to write, but didn’t think she was very good at it, and she never really had anything to write about. She finally decided to get serious about writing and hired a writing coach, just four months before her father had his stroke. She dropped everything to fly from Vermont to Montana every two weeks to take care of him. Sometimes the trips were more frequent, depending on how he was progressing. Nearly four years later, however, based upon the experience her family went through, St. Martins Press published “Into the Blue.” The theme in this novel is one we should all aspire to: persevere, persevere, and then persevere some more. Susan Edsall says that the central message of her book is to go after what you want, no matter how crazy it might sound. For her family, it was simply a matter of holding onto the razor-thin hope that Papa Edsall would be back in the cockpit again. “I always knew he would,” Marcia Edsall said. As for Wayne Edsall, he has a message to the aviation community. “Keep the shiny side up,” he says with a smile. 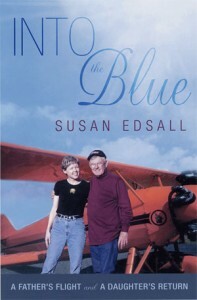 “Into the Blue: A Father’s Flight and A Daughter’s Return,” is now available at local bookstores, through on-line booksellers, and at [http://www.susanedsall.com]. For more information on strokes, visit the National Stroke Association’s website at [http://www.stroke.org].